At the beginning of this issue Batman is fighting the Firefly. The Firefly is able to break away and tries to send Batman down into a burning theater. Batman saves himself with his bat rope and returns to Wayne Manor. Bruce is to attend a Wayne Foundation Gala planned months in advance. Alfred tells him it would be a bad idea not a attend seeing as how the media knows that the Batman has been operation on less than 100 percent. One of Bane's henchmen tells Bane about the Gala and how one of the Batman's rouges might show up. Bane knows that where there is trouble the Batman will be there to try and stop it. Azrael goes out on patrol alone without Robin and foils a robbery at a factory. Azrael pretty much beats the villains into a bloody pulp. On the other side of town The Joker and The Scarecrow still hold Mayor Krol hostage. They force him to make phone calls to the Gotham City Police Department. The Mayor tells them that he is being held at an amusement park. The GCPD race to the amusement park only to find a tape recording of the mayor and a bomb. The swat team that heads in gets killed and Joker and Scarecrow still hold the mayor hostage. Back at the Gala Poison Ivy uses a nightshade to lull everyone into a strange hypnosis. Bruce notices that something is wrong and slips in his nose filters from his utility belt. The women are left behind as the most wealthy men in Gotham are taken away to Ivy's hideout. When Bane shows up at the Gala and sees Bruce being lead away buy Ivy he knows that Bruce and Batman are one and the same. Once in Ivy's hideout Bruce heads off and slips into his Batman costume. He saves Lucius Fox from being kissed and killed by Poison Ivy. Ivy calls out the men who have already been infected by her charms called the Dead Fellows. 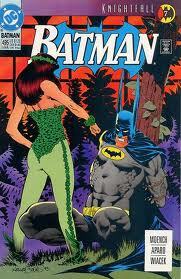 After using up every last ounce of his strength and agility Batman defeats the Dead Fellows and knocks out Poison Ivy. Bane watching can tell that the Batman is ready to break.